Bank of Baroda issued the BOB Senior Relationship Manager Recruitment 2019 to fill Human Resources for Walth Management Services On Contract Basis which include a total of 100 Vacancies, where the Experienced postulants must apply @ www.bankofbaroda.com in the Online mode before 29th March 2019 where the Receiving of applications is started from 08th March 2019 itself. Bank of Baroda invites the candidates for BOB Sr Relationship Manager Vacancy who are waiting for the Bank Job which is to get placed on the Prestigious Post, The BOB Senior Relationship Manager Recruitment is issued for the Participants who are completed the MBA or equivalent, the course is required to be of 2 years duration and Full time. There is no eligibility who did their Graduation In Distance. So, If you are really want to join in the given vacancies recruitment Process, you should know the Official Notification details. So, the clear details are enclosed on this page. Various posts are avail for the aspirants. Check out the complete specifics if you want to join in this BOB Recruitment. Check the RecruitmentIndia.In the main website to know the regular updates. The BOB Territory Head Online Application is valid from 08th March 2019 only. So, Dear applicants wait for some time the Application will be opened shortly. In the meanwhile, you can check the Vacancy details. It will be very helpful for you in the Registration process, By knowing the full details regarding the BOB Senior Relationship Manager Notification Details you can easily upload the Necessary documents in an easy way. So, All should apply your details before the Termination of the Application. Or else, your application will be rejected by the BOB Officials. So, Be careful while filling the Application form on time. We give the Important dates to the Recruitment Notice. Kindly notify all the Nesary dates. You can have the time to submit the BOB Sr Relationship Manager Application Form on 29th March 2019as its the last date. If you want to know the Latest Notification which is related to Bank Sector Jobs you can also check now. Senior Relationship Manager i) Graduate from Government recognized University or Institution. Preference will be given to candidates having MBA or equivalent degree from reputed Colleges. ii) Minimum 3 years of experience as a Relationship Manager in Wealth Management with leading Public / Private / Foreign Banks / Asset Management Companies (AMC). Territory Head i) Graduate from Government recognized University or Institution. Preference will be given to candidates having MBA or equivalent degree from reputed Colleges. ii) Minimum 8 years of experience in Wealth Management out of which minimum 2 years experience as a Team Lead. To Qualify the BOB Senior Relationship Manager Recruitment Notification 2019, aspirants will be selected through On the basis of shortlisting and/or Written Test and /or Personal Interview and/or Group Discussion. As per the Norms of Bank Of Baroda, the Selected Candidates will receive Monthly Salary and the grade pay will be as per the norms. 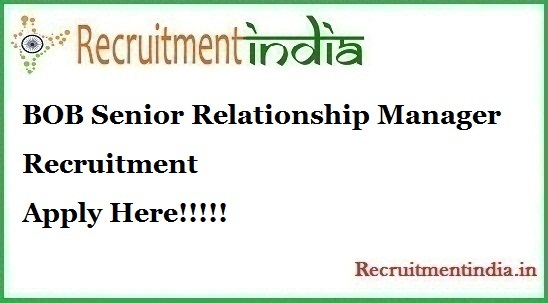 Senior Relationship Manager Ahmedabad, Anand, Rajkot, Surat, Vadodara, Indore, Mumbai, Jalandhar, Kota, Udaipur, Chennai, Kanpur, NCR, Kolkata. Here is the BOB Senior Relationship Manager Notification is issued for the desired candidates. There is the BOB Territory Head posts are required to be filled up the 100 vacancies. So, Dear one must use the fortune to get on the BOB. The Selected candidates get the posting at the nearby the BOB Branch likely in Mumbai. So, The BOB choose the candidates based on the Requriment of the Bank Of Baroda. After shortlisting, the Candidates will be required to sign an employment contract. If your Audition completed then, only you can go through the Registration process. All the interested candidates must and should apply for this BOB Sr Relationship Manager Vacancy before the last date is 29th March 2019. Candidates can check the Bank of Baroda Territory Head Notification and then know the Selection process will be very tough. So, here you go to know the Syllabus also. It is necessary after completion of the BOB Group Head Notification Registration process. All should complete the Registration before the Last date. We give the Direct source to upload your Details without getting any ambiguity. The Final list of candidates around 100 to work in the BOB Organisation. So, use the fortuitous to get placed in the Exalted Bank Of Baroda in the vacant seats of Senior Relationship Manager, Group Head, Operations Head, Territory Head & Other Posts. The Application is in the process until 29th March 2019. Interested candidates can apply for this BOB Sr Relationship Manager Vacancy. Pay the fee as per the norms of the BOB Senior Relationship Manager Recruitment.